Showcase the work of 75 plus student artists by recognizing the innovative ideas and acquired skills inspired by outstanding faculty and the wide variety of art classes. Establish an ongoing program, which creates opportunities for a multitude of art students to receive the same recognition as their athletic peers. 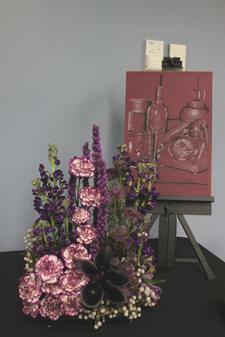 Provide public exposure and education about floral design as an art form. Educate the public about the flowers and plant material through plant identification signage with each display, while experiencing the “floral interpretation of art” concept. Appreciate that each of us views art from a different perspective. 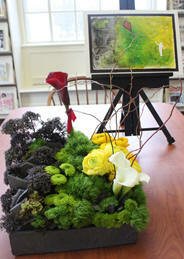 This is the challenge and the fun of an Art in Bloom experience. In 2009, members of the Beth Shalom Garden Club were seeking a new community outreach project. Members decided to create their own Art in Bloom exhibit modeled after the Boston Museum of Fine Arts - Art in Bloom, which pairs famous museum artwork with floral interpretations by members of many garden clubs. The garden club’s adaptation on the theme is to pair the varied media of Needham High School’s student artwork with creative floral interpretations by garden club members. 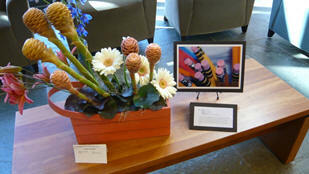 With a grant from the Needham Cultural Council, Needham’s Art’s in Bloom was formed. Our local supermarket, Roche Bros., is the primary sponsor, with additional funds by TripAdvisor this year. We went from 22 displays in 2009 to 77 displays in 2016 with approximately 2800+ spectators coming to view the exhibit over the weekend long event. In order to exhibit more students artwork, members from other local garden clubs (Needham and Kalmia Garden Clubs) are now included. Partnerships for the community event also include Needham High School, Needham Public Library, Needham Senior Center, and Needham Town Hall, which serve as hosts for the display. Starting in the fall, Beth Shalom Garden Club members spend approximately five months organizing the project, updating and implementing various forms of publicity: website, internet, newspapers, local & high school cable TV, flyer distribution, etc... The garden club also communicates with the various town departments, and plans for floral designers’ needs. In addition, the club plans the Sunday afternoon reception for high school artists, faculty, families, and floral designers where ribbons of recognition are presented to each of the students. We meet with the faculty team from Needham High School Visual Arts Department to review the program and implement new ideas. In 2016 we added live demonstrations of art and floral design. Shireen Yadollahpour, our Needham High faculty liaison since 2009 and now assisted by art teacher Kate Laberge, oversee the student art selection process. They ensure representation of novice to advanced artistic abilities from all the high school art classes. In February, the art faculty provides assignment descriptions and photographs of student artwork, which are distributed to floral designers at the garden club’s “kick-off” workshop and luncheon. Art teachers and students handle organizing easels, mounting, and delivery of the artwork. A garden club member arranges newspaper and cable TV interviews between artists and floral designers. In March, garden club members trek to Boston’s flower market to find exactly what they need. Many make their own containers. They are responsible for keeping their flowers fresh during the weekend. 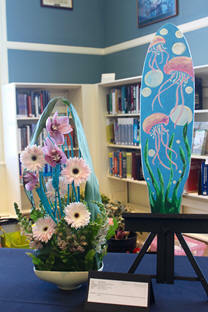 Some student artwork and accompanying floral designs are previewed at various sites on Friday, and then the entire show is set up at the Needham Library for Saturday and Sunday. This multi-generational exhibit brings together groups that travel in totally different circles; Garden Club members doing the flower arrangements, high school art students, people coming to the library, seniors who are bussed from Avery, Newbridge, and Wingate senior communities, plus our sponsors Roche Bros. and TripAdvisor. The weekend long event is accessible and free. Meet with administrators of the high school as well as teachers in the art department to introduce the concept and give them a chance to ask questions and provide input. This will create a “buy-in” for support and execution of the model. 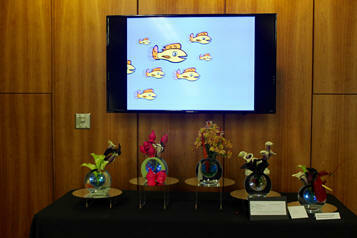 It would be wise to keep the numbers of exhibits and venues limited for your first attempt organizing an art in bloom. Your success will dictate your growth. Invite potential donors to the exhibit. Garden Club Federation of Massachusetts (12,000 members) honored us with their Special Achievement Award and encourages clubs throughout the state to do all kinds of variations of the “floral interpretation” concept. For example, one could do floral interpretations of books, holidays, jewelry, fashion, etc… One way, Beth Shalom Garden Club adapted this model was to enhance displays at a Massachusetts General Hospital Art Auction Fundraiser. As mentioned above the idea can be replicated in many ways. Let your imagination be your guide.